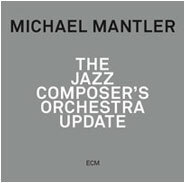 In the process of digitizing various old scores, Michael Mantler re-acquainted himself with some of his earliest compositions, in particular the material from his classic, ground-breaking 1968 double-album The Jazz Composer's Orchestra which had featured such icons as Cecil Taylor, Don Cherry, Roswell Rudd, Pharoah Sanders, Larry Coryell and Gato Barbieri as "free jazz" soloists within the context of a large jazz orchestra. Only some of these compositions were performed live, in 1969 at the Electric Circus in New York. Mantler became intrigued anew by this music to envisage performing it again, and the ensuing JAZZ COMPOSER'S ORCHESTRA UPDATE project was presented and recorded at Porgy & Bess in Vienna during 2013. The program included a complete re-working of all the pieces from the album, as well as of even older material, some of it never before performed or recorded. It was also performed live during 2015 at the Moers Festival and at the Lisbon Jazz Festival (with the Orquestra Jazz de Matosinhos). Another performance took place at the German Jazzfestival Frankfurt (this time with the hr-Bigband). The project was again presented with the Nouvelle Cuisine Bigband at the North Sea Jazz Festival in Rotterdam during July 2016. What was the Jazz Composer's Orchestra? In 1964 Carla Bley and I had formed a large orchestra as part of being involved with the Jazz Composer's Guild, a collective of musicians and composers in the field of new jazz that was created to hopefully enable them to work unencumbered of commercial constraints. The original musical premise was to create an orchestra that would present free jazz within a larger, more controlled orchestral environment. A recording of some of the orchestra's early live performances from 1965 (Communication) was released, and to continue from there we eventually established the Jazz Composer's Orchestra Association, a non-profit organization to commission, perform, and record new compositions. During 1968, as its initial project, a double album of my music was recorded, entitled The Jazz Composer's Orchestra, with soloists Cecil Taylor, Don Cherry, Roswell Rudd, Pharoah Sanders, Larry Coryell, and Gato Barbieri. Some of this music was also performed live at New York's Electric Circus in 1969. You wrote much of this music while still in your early 20s. The fact that you could arrive in New York, as a young European from Vienna, and gain the trust of some of the heaviest soloists of the free jazz movement - players such as Cecil Taylor or Pharoah Sanders - seems to speak of enormous self-assurance. Is that the way it was? I never really thought about it much at the time, but, in retrospect, it was probably quite audacious, perhaps even presumptuous, to involve musicians of that stature in my music. They were, after all, the real giants and innovators of a radically new music. But it was a rather small scene and most everybody knew and worked with each other, having formed a kind of bond through necessity, since we were involved in a music that was commercially totally unviable and often even quite disliked by the mainstream audience and critics alike. How did this present album come into being? In the process of digitizing various old scores during 2012, I had re-acquainted myself with these compositions as well as earlier ones, going back as far as the very first (and unrecorded) one in the series. After not having listened to this music for a long time, I was impressed by how fresh and exciting it still sounded, even after all these years. It seemed that the music should perhaps be allowed to have another life, reaching a new audience that would probably never have known it. I began discussing the idea with Christoph Huber of Porgy & Bess in Vienna, who had been a faithful supporter of several of my projects in the past, and he immediately agreed to produce the event at his venue, providing the necessary financial and technical support to rehearse, perform and record this music. What exactly were you "updating" and why? How did you decide which pieces to select? What were your musical and sonic criteria? Regarding the idea of an "update," for me that implied an adding to and an improving of the original material. As a given historical element I wanted to retain the same instrumentation. Musically, I strove to keep as much as possible of what still sounded right to me of the notated segments of the scores, but in the end without any restriction imposed on myself as to changes that I might now feel necessary to make. Certain of the compositions remained almost unchanged, while some were so extensively revised that one could consider them almost as new compositions that nevertheless grew from the original materials. Sonically, what has of course changed drastically is the sound. The new recording is vastly superior technically to the original, which was - although recorded at RCA Studios, one of the most advanced studios at the time - done on just eight tracks by engineers who had never heard anything like this music before. Today's incredibly advanced recording and editing techniques enabled me to achieve an entirely different musical clarity that was obviously not possible during the original recordings. Is there anything in particular that has changed about large-ensemble jazz (and free improvisation) today that necessitated this album sounding different than the original? Or is it just a question of the times and the musical personalities? I don't think today's large-ensemble jazz, or free improvisation, has much to do with it - but I'm not all that familiar with the current scene. I will say that on this Update album the performances by the musicians in the orchestra are of a much higher technical and interpretative level, with much more exact playing of the parts than in the original versions. As for the soloists, I deliberately chose mostly other solo instruments and personalities, in order to avoid a "re-do" and to achieve a true "update" instead. It's not really appropriate because the premise is a different one. The soloists I invited at the time were truly original and unselfconsciously so, almost like "forces of nature." I knew their playing and their capabilities extremely well and the original compositions were specifically tailored to these particular individuals. On the other hand, nowadays jazz musicians are so well-educated that they can play anything, not only in terms of technique but also style. There are players now who can perfectly imitate Cecil Taylor or anyone else they choose. I am not interested in that. Yet, there are nevertheless the relatively rare exceptions who are able to transcend their technical brilliance and who remain distinctly original in interpreting a piece of music creatively. Did anything specific spur the prominent use of electric guitar and amplified string quartet on Update? And how did you choose the other soloists? Had you worked with any of them before? I used the electric guitar as early as on the original Jazz Composer's Orchestra album with Larry Coryell and then ever since - for its power, its variety of sonic possibilities and its ability to "sing," even though being an electronic instrument. As for its use in the context of this new album, only the force of an electric guitar could match the ferocity of Cecil Taylor's playing. It seemed a logical choice, and so was Bjarne Roupé, an exceptional guitarist, who has been playing my music for two decades. Having also already worked with the radio.string.quartet.vienna in the past, I particularly appreciated its versatility and musicality. Being capable of playing notated music perfectly, as well as improvising freely and creatively, and being an "amplified" string quartet, with a strong, intentionally electronic element as part of their sound, it could oppose a full orchestra. The whole quartet as "soloist" was a logical choice then to interpret the piece originally written for Larry Coryell's guitar as well as even being capable of adding a new dimension to the "updated" Preview, probably the most powerful piece with Pharoah Sanders on the original album. As for the other soloists - I've known and appreciated alto saxophonist Wolfgang Puschnig for many years, although mostly having worked with him in the context of Carla Bley's music. I found tenor saxophonist Harry Sokal and pianist David Helbock specifically for this new project. All of them are wonderfully creative players, who not only immediately understood and interpreted the music without necessarily being influenced by the original versions, but were also able to contribute the rather elusive emotional quality that I feel is indispensable for my music. Why did you decide to hand over the conductor's role to Christoph Cech for the new recording? How did you come into contact with the Nouvelle Cuisine Big Band? I am not a conductor, even though I did conduct the orchestra on the original recordings. These scores were unconventionally written, without time signatures or bar lines. The notes were normally notated, but most durations as well as pauses were shown graphically, visually approximately related to time passing. Parts for each musician included a reduction of the whole score as a guide, which enabled them to relate to each other. The conducting was done entirely by giving downbeats for entrances of individual notes or for whole musical phrases or even groups of freely played materials. Dynamic changes were also indicated manually. The orchestra musicians worked out their phrasing during rehearsals, almost like learning the music by rote, with the final performances resulting in a very musical and personal way of rendering the score. I, as the "conductor," was thereby much more "playing" the orchestra as an instrument than just instructing it to follow strictly notated music. The Updates, however, for convenience's sake, were now exactly notated according to established music notation conventions in terms of meters, tempi, note durations and dynamics. Solo lengths were also specifically controlled, which was not necessarily the case during the original recordings. This, then, required a classically trained conductor, which I am not, and I felt neither qualified nor comfortable in attempting to act as one. I therefore wanted to find someone who would already be somewhat familiar with my music, and also be competent to conduct the new scores to get the best readings possible. Since I had worked successfully with Christoph Cech on a couple of occasions before, he was the perfect choice to take on that role. I also wanted him to work with me on assembling the orchestra, and as it so happened, he already had a large working group of his own, consisting of extremely capable and enthusiastic young musicians. After making a few changes to adapt it to my desired instrumentation, his Nouvelle Cuisine Big Band was chosen to be the orchestral body for this project. It's good to hear your trumpet, right away, on the Update. Your distinctive sound as a player hasn't exactly been over-exposed on recordings in the 21st century so far. And if we go back to the 1960s it wasn't featured on The Jazz Composer's Orchestra, either. What's the current status of your relationship to the instrument? I don't necessarily need to hear my own trumpet playing in all my music. My function with the Jazz Composer's Orchestra was simply that of the composer, producer and conductor, guiding the performance and recording of the music, which in itself was an all-encompassing activity. It wouldn't even have been possible to play the trumpet at the same time, nor was it necessary (there was Don Cherry, after all ... ). During my career after that I've done many projects that didn't involve my trumpet, although, more recently, I do like to include myself more and more. But I'm not someone who plays his instrument every day. Sometimes several years pass without touching it. I think that it retains a certain freshness when I at last do pick it up for a specific musical purpose or project. The orchestral frames which are containing and channeling the energies of the improvisers don't feel like artificial constructs. This is not the uneasy alliance of idioms that the so-called Third Stream had paraded at the start of the 1960s. You shaped forms that radiated their own elemental power and directly addressed the force-field of the players. Where did your musical language for the structure of The Jazz Composer's Orchestra come from? I don't really know. I hardly ever analyze my own music after the fact, and I don't encourage listeners to think that way either. I have never used formal composition techniques, so we'll probably have to talk about musical influences. I had, of course, early on listened to all kinds of music, certainly the whole historical range of jazz as well as mostly contemporary classical music. Although I've never seriously analyzed or studied scores, I was always particularly interested in larger structures and ensembles: Ellington, George Russell, Gil Evans, Mingus, Stravinsky, Bartok, Varèse, Messiaen ... but I'd also need to mention Cecil Taylor, whose music I've always considered to be orchestral. So something from all these sources must have been absorbed and somehow surfaced in my music. On a technical, theoretical level I'd start, of course, with some structural and harmonic ideas or constraints, always related somehow to the players. But many, if not most, of these formal, self-imposed restrictions would end up being changed or disregarded in the course of composing, as I followed some thread of an inherent musical logic, which in the end may be quite incomprehensible, even to me, as to how the final result was achieved. In terms of your own work, how have your feelings about the validity of improvisation changed over the years? If one follows your albums it seems for a long time to be given less room - as if you have lost faith in it. Has the ratio of composition to improvisation changed from the original album to the new one? Very much so. Even though the original idea was, even then, to control and somewhat limit what were, in my opinion, the "excesses" of free improvisation, both in terms of content as well as extent, I came to find that there was still too much of it. Over the years, I have generally come to favor integrating improvisation ever more with notated compositional elements by providing more specific materials and "surroundings" for the improviser to relate to, in order to create a composition as homogeneous as possible. Never in the form of conventional "chord changes," though, since I find that this most often results in pre-conceived improvisational modules. This, by the way, in contrast to the role of the improvisers on the original recording. They had no specific written materials of any kind, other than a complete reduced score, indicating what the orchestra was playing, and cues as to when they should solo. What feelings strike you when you listen to the original album now? And what are your impressions when you hear this new group perform your updated scores? I still love that album for its power and excitement and the absolutely exceptional improvising - to me some of the best playing ever by those soloists. Hearing the new versions I feel that they can hold their own quite well and, in fact, express perfectly how I think this music should sound now.